It’s that time of year again! When you ask – Will you be my Valentine? If you can’t get up the courage to ask in person – ask the Magic Conversation Heart Valentine! I came up with this idea and sold it to Family Fun Magazine in 2008. It appeared in the February 2010 issue. They called it the Oracle of Love and modified the directions to cover the jar with air drying clay, which makes the fortune teller look really awesome! I had considered the same idea, but had decided it would be too expensive. My original directions covered the jar with craft foam. The directions are below. 4. Measure the craft foam to cover the jar. Trace around the lid and cut out a piece to cover the top of the lid. To cover the sides of the jar, measure the height of the jar including the craft foam on top of the lid. Next measure the circumference of the jar. Cut a rectangle of craft foam with the height of the jar and the length of the circumference. 5. 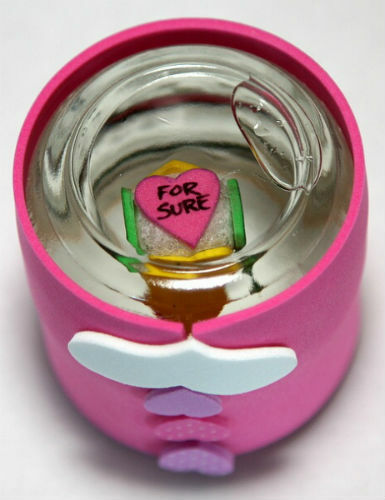 Fill the jar with water and float the conversation heart cube inside. Carefully fill the jar as full as you can without it overflowing when you put the top on. Screw down the top tightly. 6. Using permanent double stick tape, affix the craft foam to the jar. Then decorate the jar using permanent markers and craft foam stickers or cut out craft foam shapes. I think that’s a really cool project and fun valentine gift. Thanks, Ms. Ivy! Glad you like it! It’s one of my favorites and my kids had fun playing with it. They enjoyed it so much, I wondered if it was still around after our move and I just found it this morning. Four years later and it still works!